Now to pick up where I left off – Part 2 of our first trip to mainland China: Guangzhou. There was a little drama at the Guangzhou train terminal, because two of our girlfriends, Soohyun and Ilaria, didn’t get off the train at the right stop, luckily, they were able to contact us even though normal Hong Kong SIM cards don’t work in mainland China, and get back on the returning train just 20 minutes later. We found our hostel, which was super nice and clean and safe, without much trouble or asking people on the streets, checked in, were directed to yet another cheap and delicious restaurant a 5-minute walk from our accommodations (there was absolutely no English or pictures on that menu, but thankfully Angela and Soo knew enough to order great food for us all). We walked along a street right beside a river running through Guangzhou, which the hostel was situated on before collapsing for the night. The inside of our lovely hostel in Guangzhou. Comfy. Part of dinner. 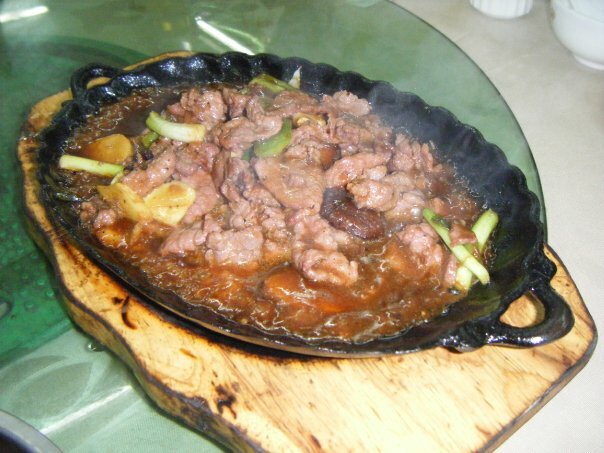 Similar to snow peas beef. Yum! 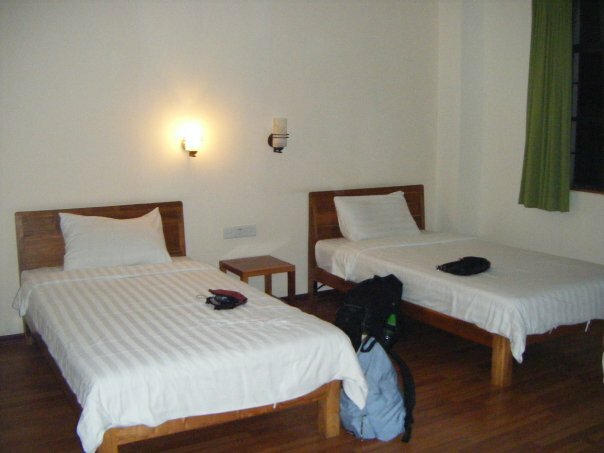 That was my first experience in a hostel and I got very lucky with it. As I said, the hostel was clean, well-lit, relaxed and the proprietors spoke English. I’m glad that my first experience was so positive as some of the places I stayed later weren’t as nice. Don’t get me wrong, they were all decent, but this one was definitely on the nicer end of the spectrum. Sunday was yet another action packed day. The previous day, Micro had written down the name of a restaurant in Guangzhou famous for its dim sum. We found the restaurant, called “Guangzhou Restaurant” (very original), waited for about 40 minutes (a good sign of things to come), then feasted on THE BEST dim sum I’ve ever eaten. Period. Best. Dim. Sum. Ever. Hands down. It was so, SO delicious: BBQ pork buns, custard buns, dumplings, tea, flat noodles, fish balls, and so much more! And we had a lovely conversation with an old Chinese couple sharing our dining table. Although Angela had to translate, everyone enjoyed it – they were very cute telling us about their grandchildren studying in the US, and what to see while we were in Guangzhou. Somehow we finally rolled ourselves out of there, and went sightseeing with the little time we had left that afternoon, but boy, did we see a lot! Let me remember: Huali Temple (which was packed as this was the last official day of the Chinese New Year – it lasts for two weeks total – where I saw incense sticks as big as baseball bats being brought in), Jade street (I got a beautiful jade bracelet for a bargain price – about $2.50 USD), Yuixuie Park where the Statue of the Five Rams was located, plus the Sun-Yat Sen Memorial, the stadium for the upcoming Asian Olympics in 2010, numerous flower gardens and the Orchid Garden, right across the street from the park. Sadly, there wasn’t time to go to another park where bungee jumping and grass skiing was offered (even without US safety standards, I totally wanted to do the bungee jump), or a number of islands which were still in the colonial style of the Portuguese who inhabited them during the Opium Wars. Next time, I guess. 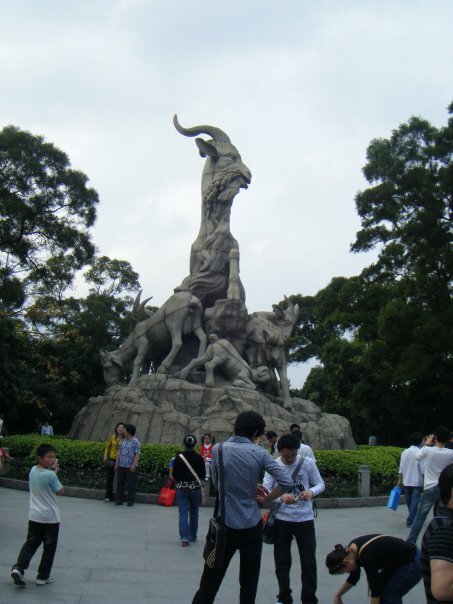 The Statue of the Five Rams in Yuixuie Park. We dragged our worn out selves back to the hostel, collected our things, grabbed a bite to eat at the train station, and took the train back to Shenzhen and the MTR back to Hong Kong and HKUST. I can tell you my feet have never been more tired (except maybe when I go to Las Vegas and walk the strip multiple times over), but that was one of the best trips I have ever had! It was so much fun because of the people I went with, the things we saw and ate, and the absolute fun we had exploring and sharing it together. I would and am eager to go back to both places in China in a heartbeat! Don’t miss my next post featuring bedazzled scooters and issues with US credit cards abroad! Ever had your plastic denied in a foreign country? It’s not a fun experience. 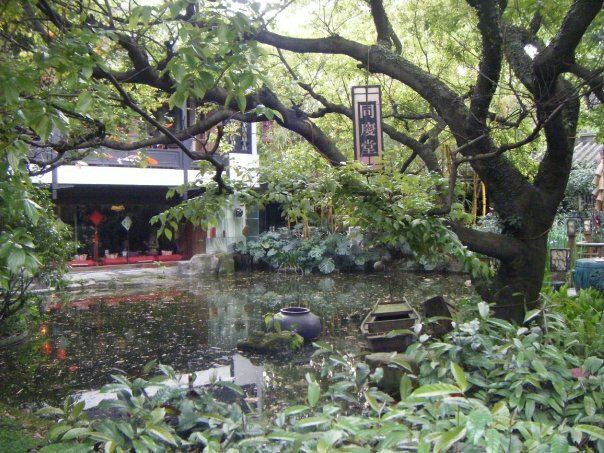 One of the gorgeous flower gardens we visited in Guangzhou. 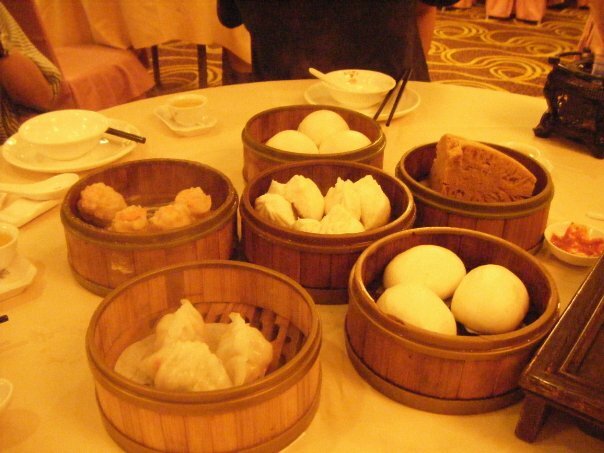 This entry was posted in Asia, China, Hong Kong and tagged Asia, China, Dim Sum, Guangzhou, HKUST, Hong Kong, Hostel, Travels on March 7, 2014 by Paige N..